With a very busy lifestyle, cooking your own meals can be challenging. This is why you’d often end up eating unhealthy foods. If you worry about its effect on your diet in the long run, then you should consider investing in a slow cooker. With it, you’ll be able to go home to a nice and warm home-cooked meal after a tiring day at work. Now, if you worry about slow cookers being big and taking a lot of space in your kitchen counter, here are the best slow cookers for one person you can check out. Glass lid and stoneware are removable and dishwasher safe. The three cookers reduce your cooking time substantially and in the same time let your serve three types of warm meal at the same time. Three 1.5 quart cookers 8 lbs. 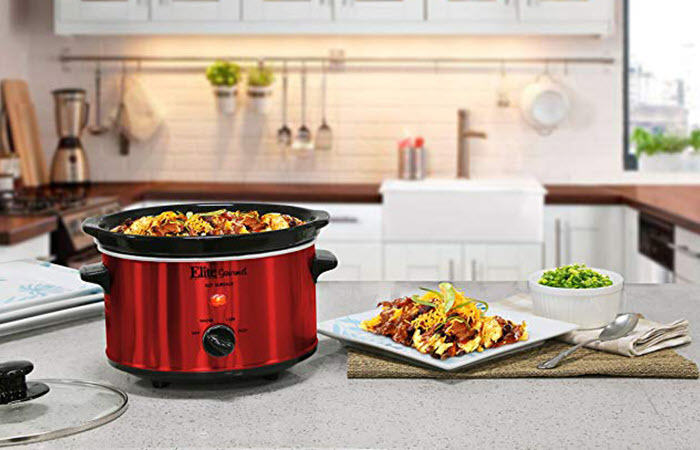 Crock-Pot 5025WG 4 $ It is manufactured as per electrical standards of North America. Comes in 2 heat setting mode. Product can easily be rinsed as it comes in clean coating. Sufficient for 2 to 3 people. 2.5 quart 6.4 lbs. Crock-Pot SCCPCCM350-BW 4 $ Stoneware is shaped rectangular with a dimension of 9x13 inches to cook lasagnas. Easy to cook and transport through locking lid system. It has all three settings. Stoneware can be used in oven as well. So you can cook meat or turkey in oven and then move the stoneware to cooker to keep it warm till the dinner is served. Consist of clamps on both sides for secure locking. The handles on the side are comfortable and insulated to heat for easy transportation from kitchen to tabletop or even outside. 3.5 quart 14 lbs. When you are living alone, you need shortcuts in every aspect of your housework. Keeping that in mind, here are some of the most important factors you need to consider when looking for the right slow cooker. Multiple cookers side by side is ideal for a single person. You can cook your primary dish, a secondary dish, and a dessert or starter as well. Crock-Pot SCLBC300-BS Trio Buffet Cooker is the only cooker in this category. The stoneware and glass lid has to be removable and dishwasher safe. The exterior just needs to be cleaned with a damp cloth to keep it shining. This is the shortest and easiest method. Other methods are time-consuming and involve a lot of work. It would be very relaxing for the consumer if the cooker has built-in technology ensuring the food is cooked rightly without any external monitoring. So, choose a slow cooker that comes with internal sensors to get this experience. How easy it is if the cooker can also be used for serving of dinner. It needs to have handles which are strong, made of insulated material and smooth just like in Crock-Pot SCLBC300-BS Trio Buffet Cooker and Crock-Pot SCCPCCM350-BW Slow Cooker. Crock-Pot SCCPCCM350-BW Slow Cooker gives a better answer to this question. It uses cord wrap to move it around, a lid liner of the gasket to seal tightly and clamps on both sides for locking purpose. This literally eliminates sloshing or spilling and enables taking casual meals and stylish buffet from kitchen top to tabletop. You need only one cooker for all your cooking needs. It is not practical to have one slow cooker for meat and another one for vegetables. One slow cooker should be enough. The best slow cooker for one person should be easy to use, cook with, and clean. The slow cookers on this list meet all of those criteria so you won’t regret purchasing any of them.